The Coalsons: Frontier Family Target of Multiple Indian Attacks. A tinge of winter chill hung in the air at the Coalson place on the Texas frontier one dawn in December 1870 and life was already stirring around the family's two-room cabin. Smoke curled from the chimney, dogs bayed and men rode off to hunt for wolves. Nick Coalson and his wife Jennie settled four years earlier at this lonely spot at the junction of the East and West Copperas Creeks in western Kimble County. They had seven children, ages 1 through 11, including a set of 3-year-old twins, Arthur and Mayetta Elizabeth. This land of limestone plateaus cut by expansive valleys was once dominated by the Comanches, a fierce tribe of nomadic Indians who had terrified Texans with their vicious attacks on settlers and settlements for decades. The warfare had quieted down by now, and except for the occasional stolen horse, there had not been a significant Indian raid in the vicinity for some time. Patrols from Fort McKavett, a cavalry and infantry base 20 miles north, tended to keep a lid on Indian raiding parties. Natives of Illinois, Nick and Jennie Coalson moved to Texas at the start of the Civil War. First, they settled near Jacksboro, then moved to the San Saba River region near Menard and finally ended up on Copperas Creek. They raised a few cattle, hogs and chickens and grew corn on a 10-acre patch cleared out of the brush. But the large family subsisted mainly on bear, deer, wild turkey and an assortment of other game that flourished in this Texas Eden. Sharing their cabin with the family was Charlie Mann, a teacher for the children, and Joe Harris, a hired hand, his wife and baby. This morning, Coalson and Mann left early on their wolf hunting excursion while Harris worked in the field. The older Coalson children played outside. Jennie, Mrs. Harris and the infants remained in the cabin. The alarm was sounded by a neighbor standing on a distant bluff. "Get in the house!" he shouted. "The Indians are coming!" Fifteen Indians swarmed out of the brush and headed toward the cabin. The children dashed inside. Jennie slammed and barred the door behind them. She told the children stay quiet, hoping they would leave them alone. The Indians amused themselves by riding the calves and hogs and shooting arrows at the chickens. Tired of this escapade, they approached the cabin and tried to beat down the door. The women fired a pistol to summon help. "Nick, did you hear that shot?" Mann asked his hunting companion. "Yes," Coalson responded, "that's Jennie shooting squirrels for dinner, or maybe soldiers from Fort McKavett." Nevertheless, they turned their horses toward home to investigate the commotion. Harris heard the same warning shot. Unarmed, he ran toward the cabin but was cut down and scalped as he darted through the yard gate. Witnessing her husband's slaughter, Mrs. Harris let out a piercing, horrified scream. A crack shot, Jennie aimed a shotgun through a slit in the wall and blasted the nearest Indian with buck-shot. Her eldest son, Stephen, begged her to let him have a shot but the Indian slipped out of sight. After dragging their fallen comrade away, the Indians prepared to set the cabin on fire. Jennie then employed a ruse: She donned her husband's coat, pulled his hat down over her forehead and cracked the door just enough for the Indians to get a good glimpse. She dropped her voice several octaves and in a coarse, masculine tone fiercely cursed the attackers. This gave the Indians pause: They thought it was a man inside. A mile or so away, Coalson and Mann were still unaware of the attack taking place at home. Thinking the nearby shots were from Fort McKavett soldiers out for a merry time, Mann yelled in the direction of the gunfire, "Look out which way you're shooting. You're liable to hit somebody." When the bullets buzzed even closer, they realized they had ridden into an ambush. "That's Indians!" Coalson shouted. They spurred their horses and galloped to the cabin, dodging gunfire and arrows the entire way. Mann's horse was hit and fell dead as they reached the yard. Coalson and Mann scrambled through the door without a scratch. With the armed men inside, the Indians broke off the attack and faded into the brush. Soldiers arrived around midnight, gave chase but the Indians had scattered and their trails lost. 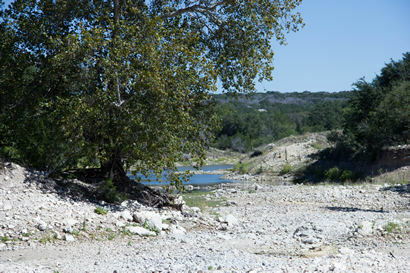 Today, about 3 miles north of IH-10 west of Junction, an historical marker on FM 1674 stands near the rock-strewn river-bed of Copperas Creek. It marks the nearby site of the Coalson's cabin and commemorates her role in masquerading as her husband to hold off an Indian attack. 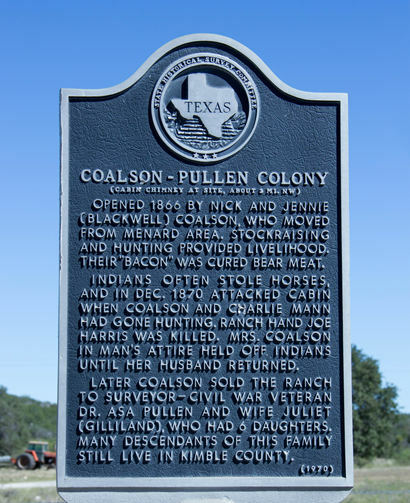 On FM 1674 "about 3 miles north of IH-10 west of Junction"
Jennie Coalson bravely held off the Indians in 1870 but died in 1875. "Few women or men ever spent a more active and useful frontier life than did this noble character," wrote author, attorney and former U.S. Rep. O.C. Fisher. After her death, Coalson moved again, this time farther south to the Half-Moon Prairie near the Nueces River in Edwards County. He took up raising goats and found a new wife, Alice Humphreys. On June 1, 1877, Coalson and two sons, John, 14, and the twin Arthur, now 10, were tending their goat herd at a remote camp at the head of Cedar Creek, a Nueces tributary. The boys were "having a great time fighting bumblebees," John recalled in an interview in the Frontier Times magazine. "It was about 2 p.m. and the first we knew of any Indians was when they began shooting at us with their six-shooters," he said. John and Arthur ran toward their father in camp. After they had gone about 30 yards, John remembered he was carrying a "cap-and-ball pistol." He stopped, turned and fired at the nearest Indian. He missed. The Indian fired at John, hit him between the shoulders and "knocked me down. The Indian then came running up, unbuckled my gun belt, and took it and my gun and my hat," he said. The rest of the Indians rode over him, shooting as they passed. Another bullet hit him in the left arm. They chased down Arthur, shot and killed him. Then they hit the sheep camp where they besieged Coalson for three hours before he escaped and dashed six miles to home. John lay where he had fallen and pretended like he was dead. The attackers returned to check on him. "When I heard them, I thought my time had come, sure enough," he said. They turned him over, and opened his shirt and then rode off, still suspicious that he wasn't dead. "I was lying there with my arms over my face, but was watching them as they left. They left one of my knees sticking up when they turned me over. I kept it that way as long as I could" before letting it fall to the ground. One Indian saw this, paused and watched for a moment or two before riding on. Burning with thirst under the scorching Texas sun, he crawled to a small pool of water held in a basin of rocks and drank. This invigorated him enough to make it to the goat camp. He poured a water barrel into another hole in the rocks. He wallowed in the pool all night to relieve the fever caused by his gunshot wounds. Later the next morning, Texas Rangers found him and treated his wounds. He eventually recovered. The Indians were believed Apaches from across the Rio Grande in Mexico. By now, they had scattered in six directions, making it impossible to track them. A year later, almost to the day, Coalson, Alice, and two children, including the couple's infant boy, rode to a creek three miles from their home to gather grapes. John and a sister, Lula, stayed behind. On the way back, the family divided into two groups. Coalson followed a shorter trail to drive his milking cows home; Alice and the children took the longer wagon road. Nick arrived home first. John asked him where the others were. When they didn't show up, John recalled, "I felt that something must be wrong." Nick stayed with Lula while John searched for the missing family members. About three-quarters of a mile down the road, "I saw something white in the road. I knew it didn't belong there. The further I went, the more frightened I got." He found the body of Arthur's twin sister, Elizabeth, in her white underwear with arrow sticking in her back. The red dress she had worn that day had been torn off. John turned and ran back to the house. Returning with his father, they found the bodies of Alice and her one and a half year old son. Texas Rangers chased the Indians past Junction, Brady and near Menard before they finally slipped away. Having suffered three Indian attacks in Texas and the loss of a wife and three children, Nick took his family to New Mexico where he died in June 1919. 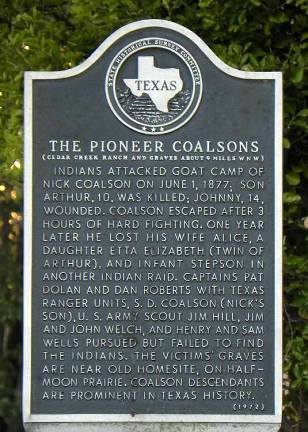 Their continued bouts with the Indians earned the Coalsons a second state historical marker, � mile north of the Nueces River on Texas 55, near Barksdale. Fisher summed up the family's experience on the often brutal and tragic Texas range: "Perhaps no frontier family tasted the bitter cup of Indian savagery as did the Coalson family." Mike Patterson is a San Antonio-based freelance writer. He has written for the New York Times Travel Section, Texas Parks & Wildlife Magazine, AAA Texas Journey and AAA New Mexico Journey magazines, New Mexico Magazine, The NonProfit Times, Planned Giving Today and the Southwest Historical Quarterly and is a frequent contributor to the Church News, published by the Episcopal Diocese of West Texas. Early in his career he worked as an editor and reporter for United Press International, the late Dallas Times Herald and the Fort Worth Star-Telegram. He recently retired after a more recent career in the non-profit sector, including stints at Trinity University and the Arthritis Foundation. He holds a bachelor of journalism degree from the University of Texas at Austin and a master's degree from the University of Missouri School of Journalism. He can be reached at rmp231@gmail.com.